Passaic County is home to several splendid outdoor spaces like Ringwood State Park. Within the county, there is an extensive system of nature trails and parks. 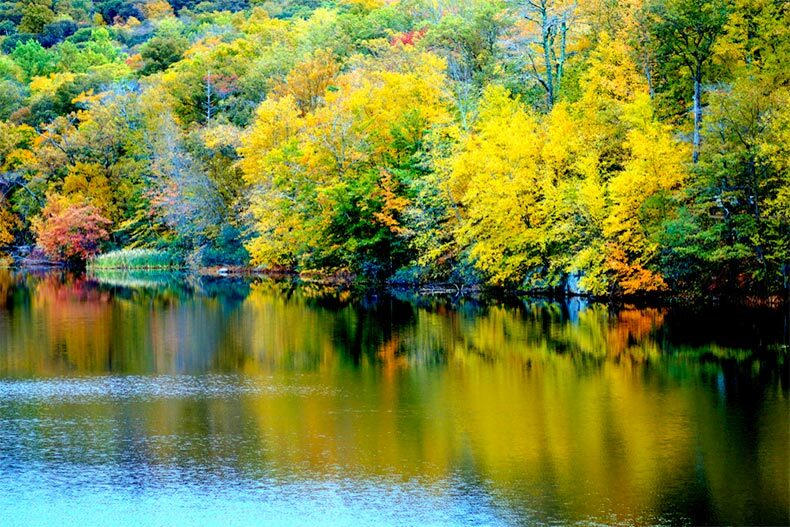 The Passaic River runs through the county, and it is also graced by natural beauty including over 25 lakes, Garrett Mountain Reservation, Ringwood State Park, and High Mountain Park Preserve. Its southernmost points are around 15 miles north of New York City, though commuting time can be an hour or more. The top of Passaic county is bordered by New York State, and this area is mostly covered by bucolic Sterling Forest and Greenwood Lake. With all that Passaic County has going for it, one might think that moving into an active adult community here would be out of reach. Although it is an affluent area, you might be surprised by how far your home buying dollars will go here. Read on for the lowdown on the 55+ communities in this county. This K-Hovnanian built condo community offers low-maintenance living for active adults seeking refined lifestyles. Four Seasons at Wayne has 230 resale condominiums are housed with 14, two-story buildings with their own elevators. The condos feature two bedrooms and bathrooms, and open floor plans. Every unit comes with two parking spots that are in the buildings’ enclosed garages. A reasonable homeowners’ association fee covers exterior maintenance and snow removal. There is also a private clubhouse with a fitness center and activity rooms, plus an outdoor pool, nature trails, bocce, and tennis. Residents also have the choice of two nearby country clubs, Preakness Hills and North Jersey Country Club. A dramatic setting, resort-style amenities and handsomely designed homes are all part of the picture at Four Seasons at Great Notch. This upscale, gated 55+ community offers 814 condo and attached homes, built by K. Hovnanian from 2005 to 2018. There are 14 floor plans offered between the community's condo villa, and courtyard collections. These range from 1,426 to 2,907 square feet and have two or three bedrooms, two to three bathrooms, and one- or two-car garages. Luxurious upgrades include thoughtfully designed master suites, balconies, dens, and decks. A 25,000 square-foot clubhouse serves at the main social hub with an indoor pool and spa, fitness center, fireplace lounge, and activity rooms. Outside is a second pool, a putting green, driving range, tennis, and bocce ball courts. There is a bounty of clubs and recurring events to enjoy, like book club, happy hours, current events, movie nights, poker, and water volleyball. Located in the northernmost part of Passaic County, Bald Eagle Commons is a well-established, gated active adult community of 463 resale condo and attached homes. The majority of these are condos, ranging from 655 to 1,581 square feet, with one or two bedrooms and bathrooms, and assigned parking spots. There are a select number of attached residences ranging from 2,175 to 2,414 square feet. Bald Eagle Commons has a wealth of amenities, which center around its busy clubhouse, Grange Hall. It has an exercise room, a media center, an arts & crafts studio, and game rooms. Outdoors, homeowners enjoy outdoor pool and spa, horseshoe pits, and tennis, shuffleboard, and bocce ball courts. There is also a community bus and a greenhouse. A community social director keeps everyone busy with organized activities like overnight trips, craft fairs, golf outings, exercise classes, and more. Winthrop Court is an intimate 55+ neighborhood designed for active adults looking to downsize while enjoying the finer things in life. It has 230 resale, K. Hovnanian-built condos housed in 14 separate buildings. Most have two beds and baths, open floor plans, nine-foot ceilings, and two assigned parking spots. A homeowners’ association fee provides for snow removal and exterior maintenance. On the property, there is a clubhouse with its own fitness center, walking & biking trails, a lovely outdoor pool and spa, bocce ball, and tennis. Commuting to New York City is easy for Winthrop Court homeowners, as it is less than a mile from the NJTransit in Clifton.